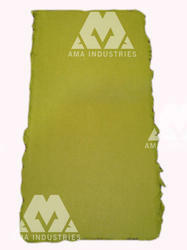 We are manufacturing and offering high quality range of handmade papers that have wide application area. Made of natural materials, these handmade papers are completely eco-friendly and recyclable. Durability and thickness of this handmade marble paper makes it ideal for making paper bags. Handmade rose petals paper . This eco-friendly handmade paper is beautified with beautiful flower petals. Flower Paper are made from the small petals of flowers which are solar dried and processed on handmade paper. These handmade paper are colourful and come in various combinations. Thickness (GSM) : 100 - 400 | Size : 22 x 30 inches or 56 x 76 cms. descriptoin : petals of rose deliver these papers a delightful color and graceful charm. These rose petal papers are feast to eyes and therefore can be used for wrapping birthday, wedding and anniversary gift. Code : # 91003 Thickness (GSM) : 100 - 400 Size : 22 x 30 inches or 56 x 76 cms. Rose Petals Paper is made from the small petals of the rose flower which are solar dried and processed on handmade paper. Use for : Stationery, Paper / Gift Bags, Gift wrapping, Wine Bags, Envelopes etc.